There are several ways you can make a charitable gift to the 2018-2019 Monsignor Farrell Annual Appeal. Gifts to the Annual Appeal are tax deductible to the extent allowed by law. To make your donation online, please click any of the options below. If you prefer to make a donation by check, please click here to download the Annual Appeal donation form. We can also take donations via credit card by phone. Please call the Office of Alumni Relations & Development at 718-987-2900 ext. 265. Give a One Time Gift to the 2018-2019 Annual Appeal. 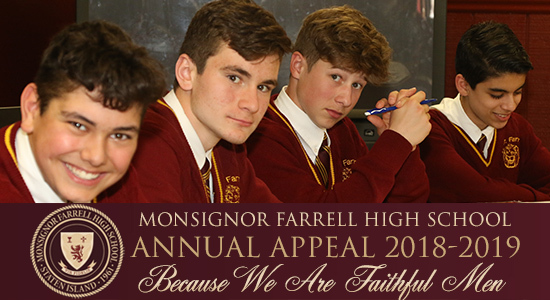 Give a Recurring Gift to the Monsignor Farrell High School Annual Appeal. Donate a Classroom Desk Sponsor a student classroom desk. You can choose to have your name displayed on a donor plaque on each desk sponsored, or donate the desk In memory of or In honor of someone of your choosing. Purchase an Alumni Stadium Paver - Engraved pavers will be placed around the Lion Statue that sits next to the track at the scoreboard-end of the stadium. Four Years of Farrell Commitment Club - Make a four-year pledge commitment of $1000 and up. Payable in installments over a four-year period. The 65 Recurring Gift Program - Commemorating the first graduating class of 1965, a $65 gift can be made monthly, quarterly, or annually. The Young Alumni 10 Years Out, 10 Bucks In Recurring Gift Program - Alumni who have graduated in the past 10 years can choose to give a $10 gift monthly or quarterly. Gifts of stock, securities, real estate, IRA rollovers and other gifts. For further assistance, or to discuss other giving options, please contact John Cusick '88, Director of Institutional Advancement.